On this day in 1870, Camile Poirer set out from St. Paul to make a new home in Duluth. Poirer was born in Canada in 1838. After his mother died he went to live with an uncle near Montreal. He worked on his uncle’s farm until he was fourteen, then left to apprentice as a shoemaker. At 18 he emigrated to the U.S., arriving first in Manchester, Massachusetts. As he could speak no English, he was forced to earn his living laying bricks and chopping wood. During this time he severely injured his leg with an axe. Dejected, he returned to Canada. There he married and started a family, but his wife died in 1864. The next year Poirer and his children moved to St. Paul to manage a shoe factory. He remarried in 1868 and decided to try his luck in Duluth. 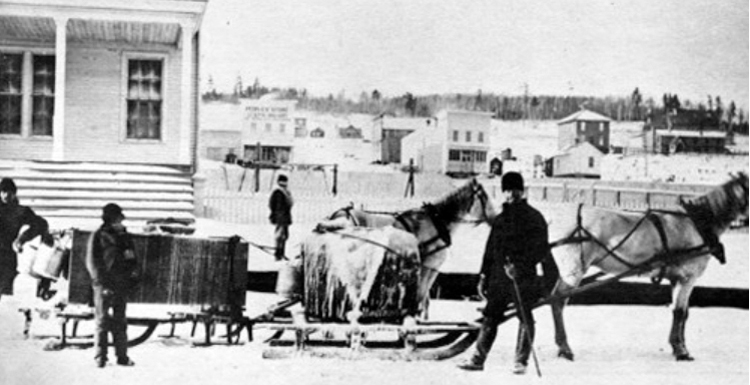 He walked to Hinkley on his maimed leg and took a stage the rest of the way—the trip took him four days “of very cold and suffering.” In Duluth, Poirer took up the shoe trade and diversified his income by also supplying fresh water drawn from Lake Superior, which he delivered in by sleigh. His shoe business thrived, but in 1882 he changed direction, filing a patent for a new type of “packsack.” The canvas sack closed with a buckled flap and included shoulder straps and other new features. Poirer called it the Poirer Pack, but it was soon dubbed the Duluth Pack. The product—and many others—are made in Duluth today by the Duluth Tent and Awning Company, aka Duluth Pack. Poirer died October 17, 1919, in Duluth.